Oregon Governor Ted Kulongoski is unique among public servants because he has served in all three branches of government as a Legislator, Supreme Court Justice and Governor. As a former Marine, the Governor was especially dedicated to supporting the the Oregon National Guard during the wars in Iraq and Afghanistan. His leadership and moral support for our servicemen and woman is perhaps what Oregonians best remember him by. I designed this painting to tell his story and everything in it has meaning. Because the painting hangs in the State Capitol I also wanted to present the Governor as approachable and as a leader. 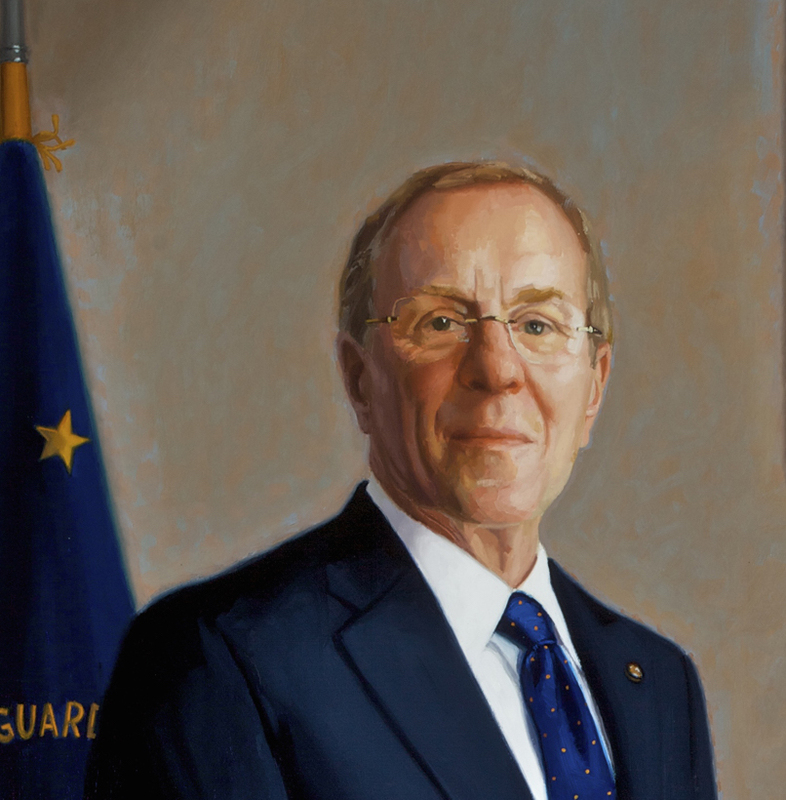 At the center of the painting is Governor Kulongoski, sharply dressed and wearing his favorite tie and lapel pin bearing the State emblem. The books on the lower right are the House Journals and Oregon Reports, which are records of the Legislature and Supreme Court respectively. Sitting on the the bookcase is Lady Justice and a bound copy of the Oregon Constitution. To the left is the Commander-in-Chief's flag, commissioned by the servicemen and women of the Oregon National Guard and given to the Governor as a gift in appreciation for his dedication and service on their behalf. The Governor was genuinely moved by this and asked the flag be placed in the painting instead of the state flag. While considering several design possibilities for this painting, I encountered Albert Bierstadt's " View of Mt Hood " while meandering at the Portland Art Museum one day. I realized it to be the perfect complement to this portrait. It balances the picture, as the arts do in our everyday lives. And recognizes the Governor and First Lady for their support of the arts as well as their love for the outdoors. We considered other ideas for this painting that would reflect who our subject is, like his love of baseball and sports, but alas, less is often more. It was a great pleasure and honor to work with the Governor and First Lady Mary Oberst. It was a collaborative project of discovery, trust, and enjoying the process unfold.